The first time I saw her waddle across the lawn I knew something was wrong. She was short in stature. Her plump little body was about the same length as her rat-like tail. That tail, and her long pointy nose extending from a normal sized head just didn’t look right. Her ears were pink and almost translucent. They looked like petals from some exotic flower. She was definitely a special-needs possum. She scanned the yard using her nose like a radar wand and then disappeared under the fence. Over the next few weeks I noticed her coming around more often, cleaning up the spilled bird seed under the feeders and rummaging through the compost box. Then one day we met eye to eye at the patio door and I saw that she was blind. Her eyes shone up at me like two silver pearls. Priscilla had cataracts. 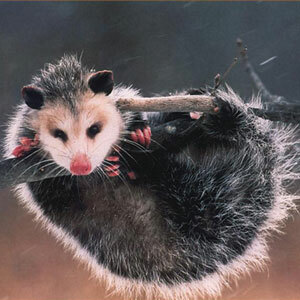 Possums are nocturnal and rarely seen during the day. I felt that she foraged in the light of day because she had no night vision. I started putting out food for her that day and watched her come through the fence, nose to the ground smelling her way through life. It was amazing to watch her sniff out her food dish that I’d sheltered under a picnic table. For a while she came at the same time every day bumping her way around the yard. She did fine on her own but if she became startled, trying to escape she’d run into everything in her path. I thought about trapping her and having her put down and then I decided to let nature look after her own. The woodlot where I suspected she lived was just a backyard away. I phoned the neighbours and asked them to watch out for her. She’d managed to survive and now with a little human help perhaps she’d be okay. She disappeared for a couple of weeks. I kept up a vigil and checked her food dish. The next time I saw her she seemed confused. On other visits if I opened the door she’d run. This time I was able to sneak past her to put out fresh food, which she soon found. Winter came and with it a possum pattern. Prissy arrived at precisely 3:00 everyday for her dinner. She’d head straight for her dish, eat and then sniff her way around the yard and back under the fence. One day she disappeared. I called the neighbours, asking if any of them had seen her. No one had. Two weeks later, I received a call saying that a possum had been lying on the side of the road near the woodlot for two days. My neighbour who called said that her husband had picked up the possum that was still alive and laid her on a snow bank. I urged them to put her in a cardboard box with a towel while I arranged to pick her up. I gathered some supplies and drove around to pick her up. Priscilla looked dead. She was playing possum, a strategy the animal uses as a defense. She was also hypothermic. I brought her home and slowly warmed her by covering her body with a blanket and placing a heating pad under her kennel. When possums go into their semi-comatose defense pattern, they also emit the smell of death. Prissy was one stinky possum and it didn’t take much persuasion on my part to let her sleep. I checked her every half hour and in time she woke up and gulped down some warmed Ensure before going back to sleep. I woke her every half hour and fed her more of the warmed drink to help re-hydrate her. She was very gentle and not the least aggressive. I left her some cut-up fruit and cat food and went to bed. She was chewing on a piece of fruit when I peeked in the next morning and she had cleaned herself up. All traces of that terrible smelly possum had vanished. I noticed that her body temperature wasn’t quite normal and she was unsteady on her feet so I decided to call our local wildlife rehab. shelter to see if they would take her in and perhaps use her in their education program. To my delight, they agreed. The volunteer who picked Prissy up fell in love with her immediately. She confirmed the low body temperature and made her a snuggly to carry her around sharing body heat. I knew watching them that I’d done the right thing. Had I released her back into the wild she would have gotten pregnant and in her condition, she’d be unable to tend to her young. The other alternative was euthanasia and I just couldn’t do that to her after all she’d been through. I checked on her daily and she continued to improve. Her eyesight miraculously improved too. Then one day she just gave up. She died warm and safe in her snuggly. I cried along with her shelter mate but knowing that she didn’t die alone in a cold snow bank or chased by coyotes lessened the pain. She was a special-needs possum and she filled a special need in my life. I miss her.